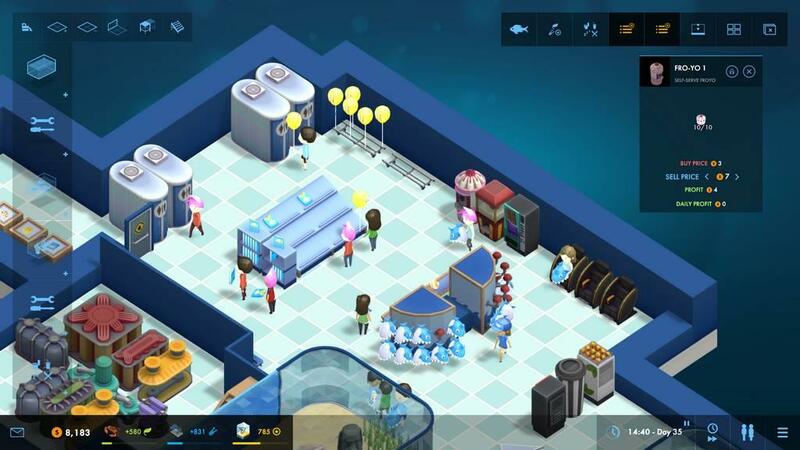 Megaquarium joins the crowded tycoon game market with bit of a twist: you aren’t trying to become a tycoon in charge of a railroad, steel plant, amusement park, or any of the other common settings for this kind of game. 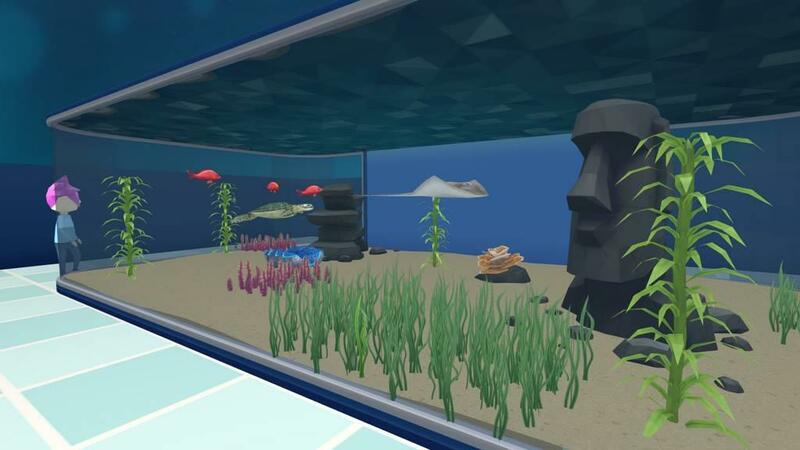 As can be gleaned from a glance at the name, Megaquarium offers you the chance to run a publicly accessible aquarium. You, as the "big fish" in the aquarium, are in charge of just about everything. The obvious duties of a manager, such as the hiring, firing, and managing of staff, are all there, but you are, actually, a lot more than a mere manager. You are also head of the R&D Department, the fish tank design expert, and the guy that decides which fish to put where. As with most tycoon games, your success or failure really just boils down to marketing in its truest sense. Many folks, myself included, don’t tend to make a distinction between marketing and advertising, even though the differences are stark. Basically, Marketing decides what to make, how much of it to make, when to make it, and when to stop making it. Advertising, on the other hand, is primarily focused on developing campaigns to sell whatever it is that gets delivered by Marketing. An obvious and natural question, then, is just what kind of marketing goes into something as dully predictable as a building full of fish tanks? Seriously, you just buy some fish and dump them into a tank full of water, right? Wrong. Just as with any money-making endeavor, the Devil Fish is in the details. There are, of course, a lot of fish in the sea, and they are not all the same. There are passive fish, and there are fish that passionately eat passive fish. While that might be an interesting and fun thing to watch for a small portion of your potential customers, the majority are likely to find it off-putting, if not downright repulsive. It’s on you as the manager to make sure that doesn’t happen, just as it is the manager’s job to make sure healthy fish don’t wind up floating belly-up in the tanks due to lack of food, proper temperature, or the cleanliness of the water itself. There is also a lot of equipment involved, including filters and heaters to ensure that the fish are being kept in conditions conducive to their health. 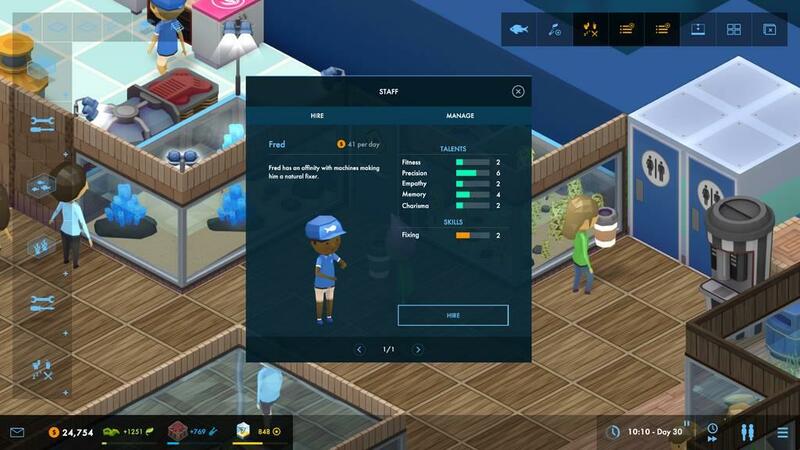 With all of that to take care of, Megaquarium helps you out by allowing you to hire helpers for most of the mundane, recurring tasks. All of this costs money, naturally. 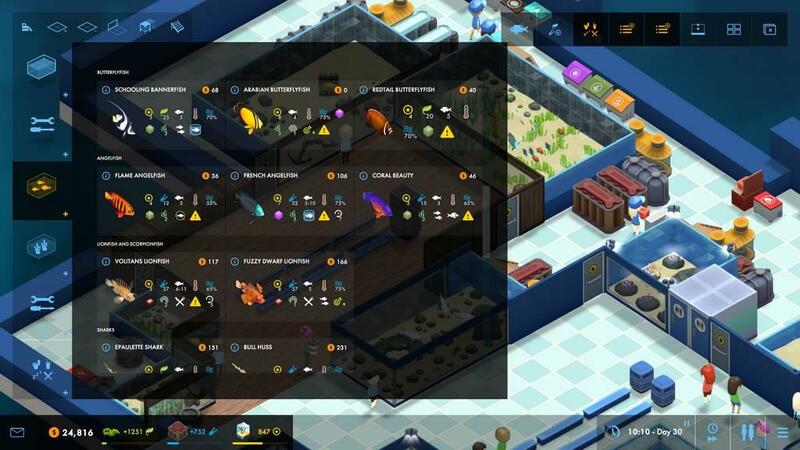 You are running a for-profit aquarium, so managing the budget also comes into play. As with any pet (or display animal), the cost of acquiring the critters is just the start of the outgoing torrent of dollars. Care and feeding are not cheap, nor are the fix-it employees you have to hire just to keep everything running well, if not exactly smoothly. There is only so much a single employee can do, and even that contribution is subject to wastage if your helpers are spending most of their working time wending through crowded, narrow aisles to get from A to B. They also have to have tools and cleaning supplies, both of which take up expensive floor space. Any area of your aquarium floor not containing, well, an aquarium is just another form of lost revenue. The more helpers you hire, the more room you lose. So, there are the basic challenges you will face as the mega-boss of the Megaquarium. How does all of that play out in the game? Pretty well, as it turns out. 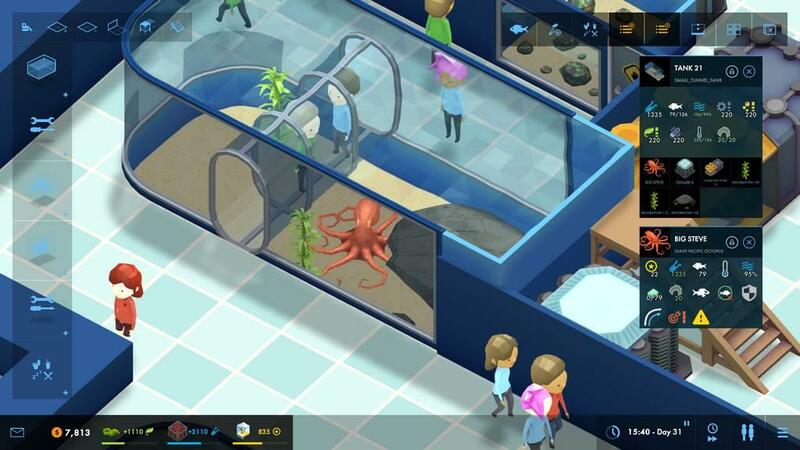 Other than a couple of rough spots, Megaquarium does a good job of simulating a good job. It is designed in such a way that you needn’t have any knowledge or experience with fish beyond what you may have gained by winning a goldfish in a jar at the state fair, back when that kind of thing was acceptable, or by wandering past a gaggle of tanks on your way to where they keep the real pets, like cats, snakes, lizards, turtles, and dogs in the pet store. You might be asking what you would really need to know about fish anyway. Well, there are a surprising amount of issues to deal with for each type of fish. They are all important, but in my experience with Megaquarium I discovered one that surpasses all others in the aspect of causing serious embarrassment: not only are some fish bullies towards the weaker fish, there are also some types of fish that will eat other fish of the same type! That’s a detail you really don’t want to miss, I’m here to tell ya. It’s bad enough to have patrons see it happen, but the true cost comes when they tell friends and media. Your aquarium’s prestige is really going to take a hit when that news gets out. It’s not quite as bad as having a gorilla die in your zoo, but it still has to be reckoned with. You also need to research new fish. Not newly invented fish; that ship sailed ages ago—you have to research fish that would make good entries in your fish collection. Beyond that, you also have to be aware of innovations in the mechanicals, such as smaller or more powerful heaters, filters, and pumps. It’s a lot to have to pay attention to. Fortunately, you really don’t have to do the research yourself—there are other people doing that for you. All you have to decide is which of their proposed subjects they should concentrate on. Researchers will come to you with ideas periodically, and you decide which of them to fund now and which can wait. Some of these things will be easier than others, so you may decide to fund something easy, or you might decide to hold off for a bigger project. It all comes down to funding. This brings us to currency. For things like the gate admission charge, employee wages, and the cost of fizzy drinks, dollars are used. Research is a bit different. Among each fish’s characteristics are values like Prestige, Science, and Ecology. These are awarded every time a customer views the specific fish the first time. Some of the more exotic fish are high in Prestige, but not necessarily Science or Ecology. 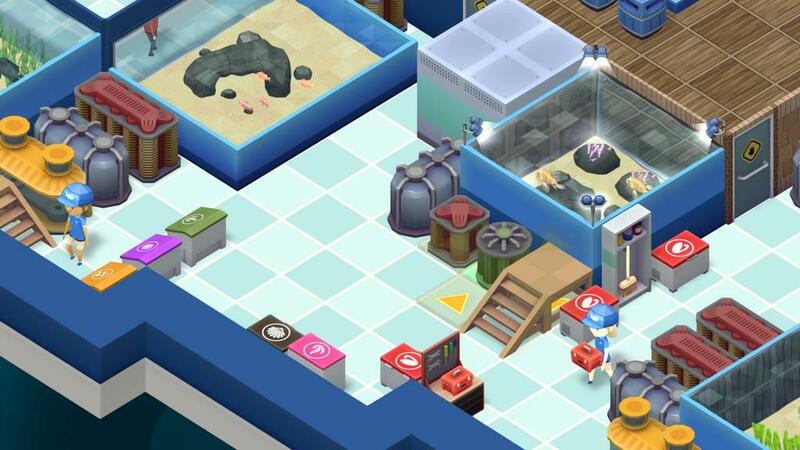 Science points are typically used for researching improved mechanicals, while Ecology points are used to discover new fish to buy for the aquarium. Prestige points are, as near as I can tell, a measure of the popularity of your aquarium, which in turn is used for level-ups in the campaign. It all just kind of works together relatively seamlessly. There are two ways to play: sandbox or the aforementioned campaign. Campaign is the mode that uses the Prestige points more heavily, as you would expect since Campaign mode is the only one that really cares about your level. With Sandbox mode, you select things like your starting level, whether everything is unlocked or if you're restricted to just the items available at the level you choose, and what difficulty to play at. Campaign mode only wants to know your preferred difficulty level at the start. Of the two choices, I strongly preferred the Sandbox mode, although it is in that mode that I ran into a rough edge. 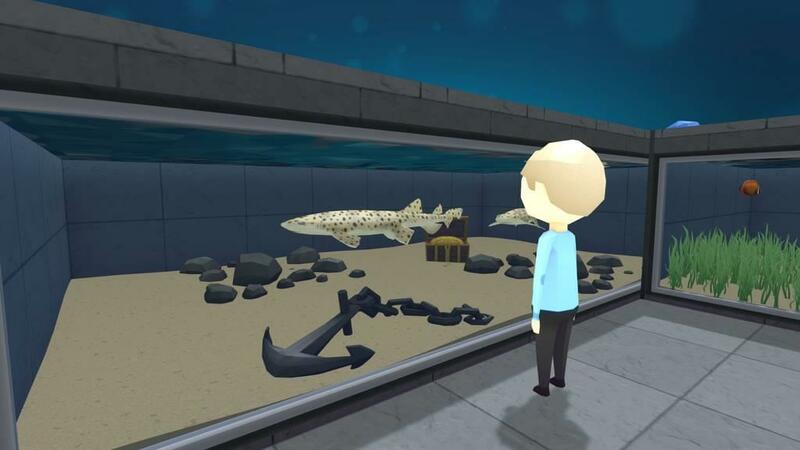 After building my Sandbox aquarium, the game started locking up every few minutes. I had no such problems in Campaign mode, which could be because I didn’t build an aquarium as complex as the one I made in the Sandbox mode. The only other small problem I encountered, which could very likely be my own fault, was forgetting to escape out of whatever operation I was doing (put fish in tank, install new heater, etc.) before trying to do other click-things like rotating the view or moving it around on the screen. 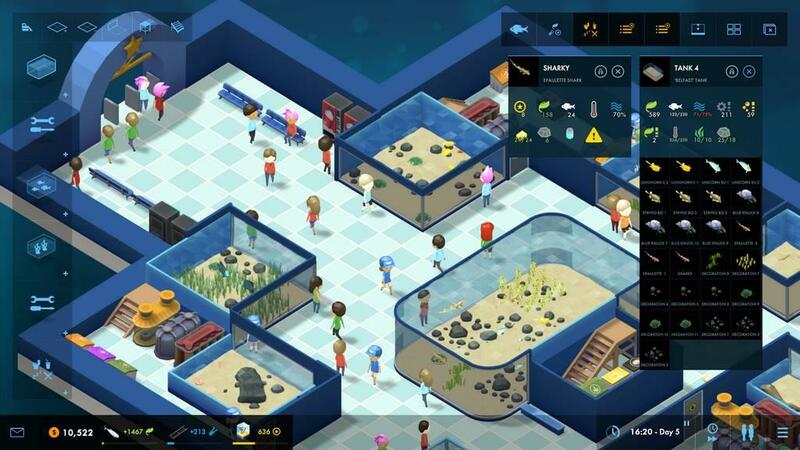 As a tycoon game, Megaquarium strikes a very nice balance between having too much complexity versus not having enough depth to remain entertaining. While micromanagement is not required, you do still have a lot of decision-making to do. Most of that comes down to learning and understanding the traits of each fish to determine whether or not it is likely to survive, which sounds like it could be a daunting task, but the traits of each fish are provided in a way that makes it mostly a numbers game when trying to determine cost versus revenue opportunity. And, of course, whether or not the candidate fish is likely to eat smaller fish or, as is sometimes the case, other fish of the same type. You really don’t want to forget to check for that.